1. Add all the ingredients into a blender & whiz until smooth. 2. Heat on medium a little coconut oil in a non stick pan. 3. Place scoopfuls of batter into the pan, to form your desired pancake size. 4. Cook 1 – 2 mins, until the edges start to firm & bubbles appear on top. Then flip for another minute or until cooked. 5. Serve with melted organic dark chocolate & roasted nuts. 6. 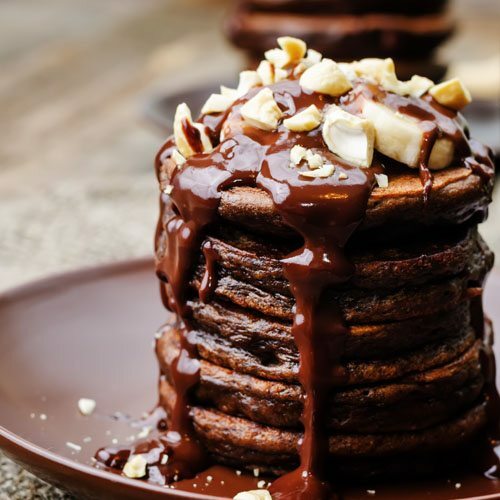 Opt extra: try adding bite sized pieces of dark chocolate to the batter for an more intense chocolate fix!